Is your facility receiving at least a few visitors each day? How do you allow access only to authorized people? And how do you make your visitors easily recognizable? It’s quite easy - you do it by offering them visitor badges. At Proxyclick, we assisted thousands of companies designing their badges and learned a few things along the way. We thought it would be a good idea to share a few of these leanings here. The tips you’ll find below are universal, but the majority of examples and screenshots here come from the Proxyclick’s ecosystem which we know best. Badges are commonly used in business and educational environments such as schools to easily identify visitors. In some organizations (especially with high levels of security), even the employees are obligated to wear badges at all time. It all depends on the company policy. Badges can be valid for a specific period of time, or used just for a single visit, and serve as a great security measure that’ll prevent unwanted visitors from entering the building. A regular badge contains the first and last name of the visitor. 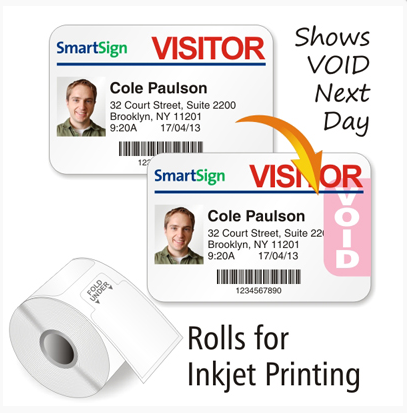 Additionally, a visitor pass can show the name of the host, company name, a picture, a date of the visit, validity code, QR code, health and security icons, visitor type labels, or a wifi code. What are the benefits of offering badges to the visitors in your organization? 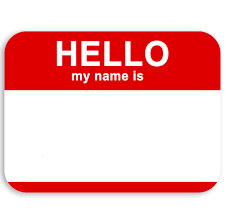 For security reasons, your visitors may be obliged to wear name tags at all times. If there’s no singular entrance and exit point (with an entry gate) it’s quite easy for a stranger to pass through the reception unnoticed. However, if they don’t wear a badge, they’ll be easily spotted by the security staff or other office workers. By providing your guests with badges, you always know who is who - especially if the visitor’s picture is printed on the badge. And if someone is walking around without a badge, they probably didn’t check-in at the entrance and shouldn’t be in the building. Adding a validity date to the badge is also important. It will prevent visitors using the badge they received in the past in order to enter the building at another time. 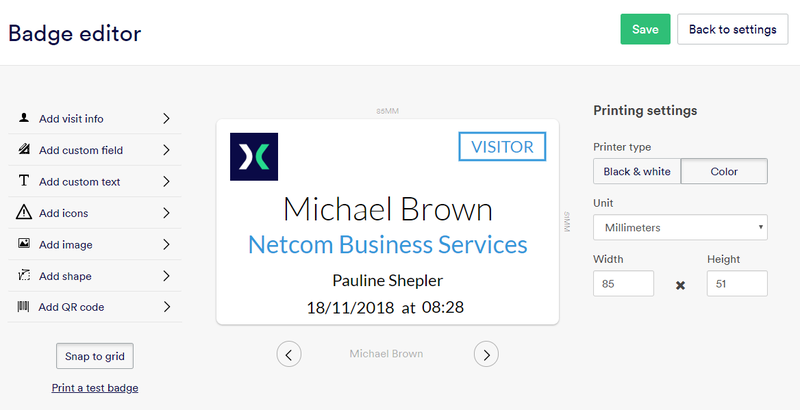 Visitor badges may be easily falsified, so for additional security, you can make them unique by adding a QR code through the dashboard of a visitor management system. Only after scanning the QR code at the reception will the visitor be allowed to pass. An example of a badge with a QR-code. Printing out badges at the reception enables you to make a great impression on your visitors. The badge may contain the colors, and the logo of your company, as well as other useful information. 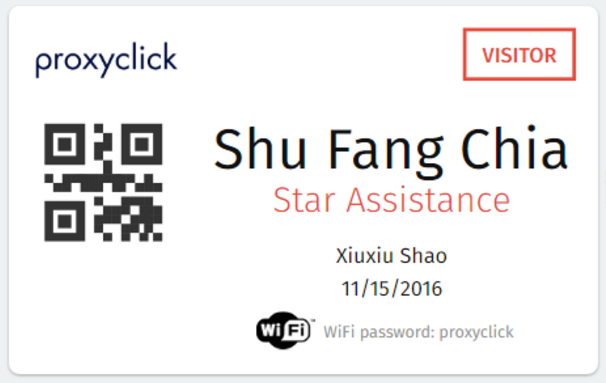 Many of our clients include a guest wifi code and the name of the host on the badge, to make the visit as smooth as possible. A badge with a guest wifi code. Pro tip: Getting the badges printed automatically as soon as the visitor checks in is a fantastic way to create modern image of your company. It slows down the check-in process. It doesn't really look professional. It doesn't allow to add lots of information on the badge. But with a visitor management system, the badge is printed automatically, and can display much more useful information. This is a huge time saver both for the receptionist and the guest. Pro tip: If you’re using an AirPrint printer ($50-$150), you can connect it through Wifi directly with the iPad kiosk to get the badges printed. No cable required! 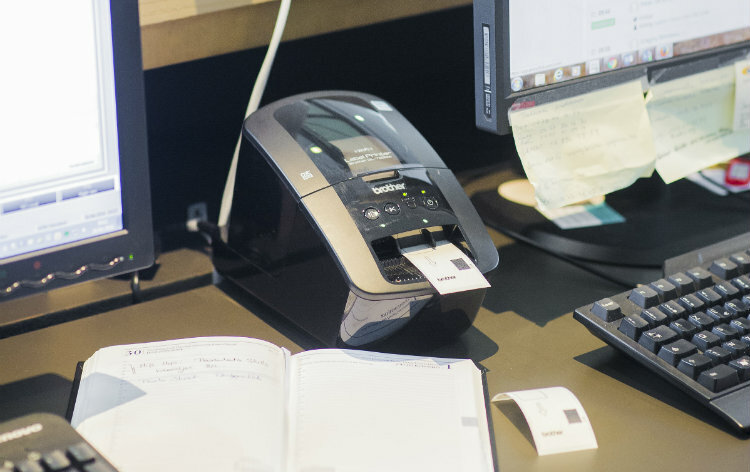 Example of a Brother printer at a reception. Depending on size and industry, certain companies rely on an ACS to grant different levels of access to their employees and visitors. By using our badge editor, you can add a QR code to each badge, so that visitors can use the code as a token to check-in and check-out much faster. Learn more about how Proxyclick integrates with your ACS. Pro tip: The QR code printed on the badge can define access rights, based on the type of the visitor checking-in. How to make custom badges for your visitors? Creating unique badges for your visitors will definitely make your company stand out. 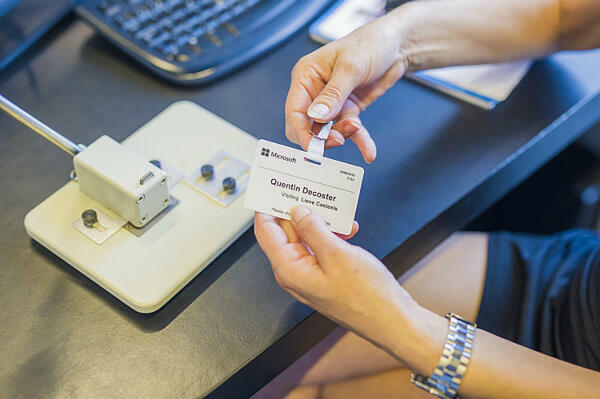 Just imagine - each person visiting your company automatically receiving a beautiful, fully-branded ID badge. If you can make it beautiful enough, the visitor may keep it or even show it to their colleagues. So how about creating one right now? The whole process is actually quite easy, and it doesn’t require advanced graphic design skills. All you need for starters is an online badge editor like the one you can find in Proxyclick’s settings. You can choose the most basic template and work from there, or you may select from other available options. Your badges may have a horizontal or vertical orientation and be black and white or colorful. It all depends on your needs. Pro tip: Around 75% of the badges are printed in a “landscape” format. The other 25% belong to the “vertical” category. It all depends on your needs, but you can usually squeeze in more information using the horizontal design, which also allows the use of larger fonts, making the name visible even from a few meters. The editor is intuitive and easy to use. Now the only thing you have to do is put the right information together. You can select and add different types of data from the drop-down menu. 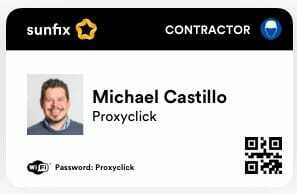 Pro tip: In Proxyclick’s badge editor, you can add a unique visit QR code that will be printed automatically on the badge when the visitor checks in. Which types of information should be included on the badge? A custom text labeling the person as a “visitor”, “contractor”, “interviewee” etc. Pro tip: “Dynamic” information, such as the date and time of the visit will be automatically pulled from the visitor’s list in the dashboard. Again, with a help of a visitor management system, you can identify different types of visitors at the reception (for example - a contractor, an interviewee, or a client). You can set up the system so that it will print a different type of badge for each type of visitor. Pro tip: In Proxyclick’s badge editor, you can show or hide different elements based on the type of a visitor. You can quickly add rules in the badge editor and show or hide different elements according to the type of the visitor. You can easily print a different type of badge depending on the type of the visitor. Keep the colors consistent with your brand’s visual style guide. Don’t use more than two or three colors. Keep it simple. Provide enough space for all the necessary elements (you don’t want your visitor’s long name to be cut-off). Use a font that will match the overall design. Keep the background white to provide a clean look, and let your images pop (and use less ink). Pro tip: In the online editor, you can print a “test badge” to make sure everything is going to work when your visitors arrive. You can also print the badges in advance from the logbook app, and get them prepared before each visit. This is a great, time-saving feature which will come in handy especially for group visits. You can print the badges on an adhesive paper. In this case, the visitor can easily place it on their attire. Using this kind of material, however, does not always create a really professional look, and adhesive badges are prone to being lost. Moreover, manufacturers are reluctant to sell badges with strong adhesives because this could stir discontent among visitors who got their expensive clothing damaged by the glue. Lanyards are fantastic if you want to reinforce your brand and add more convenience to your visitor’s experience. 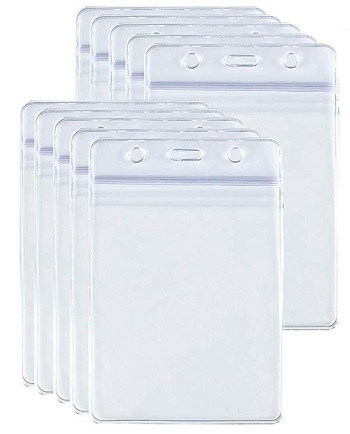 If you order them in bulk, they should cost around $1 per piece - even if they’re branded. Of course, you can pay more (up to $10) for a higher-quality product with additional features and better design. 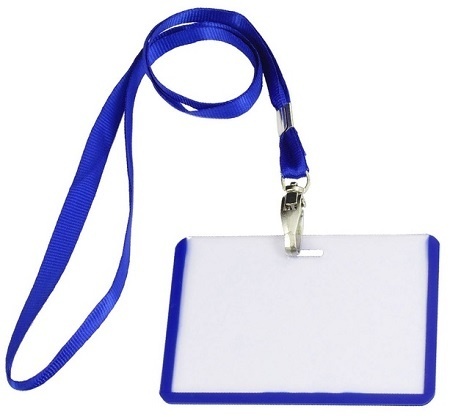 Lanyards are sold in packs of 25, 50 or 100. These badges are printed with an Inkjet or a direct thermal printer, and are usually valid just for one day. After 24 hours, a big, red “void” mark appears on the badge. This is possible because of slow release of red ink from the badge which has multiple layers. These badges are available on MyNameBadges. If you’re using plastic to print out badges, this tool (which costs around $10-$20) is going to be really useful. Simply punch a hole in the badge and complement it with a small clip. Badge holders are quite inexpensive (around 50 cents for a pack of 10), but they can really make a difference. By using the attached clip, the badge will be secure and won’t get lost so easily. They come in different sizes, so make sure you pick the one that’ll be a perfect fit. When it comes to badge reels, you can choose from hundreds of creative designs. Shop around and pick the one that will make for a great business gadget, which your visitors will keep long after their visit. 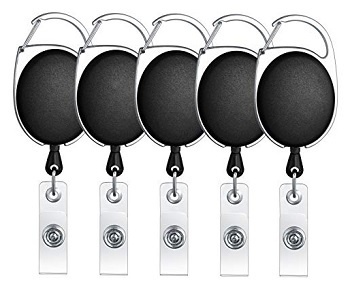 Badge reels cost a little over $1 per piece. Giving badges for your guests is a great thing you can do to keep your office safe, and create a well-organized working environment. Your visitors will appreciate getting the badges automatically, and the hosts will be grateful that they can easily recognize who’s in the building and what’s their purpose on the premises. To use all the features mentioned in this article, try out our intuitive badge editor by signing up for a free trial with Proxyclick.